Regular readers of this blog will recognise the running theme of the Deuterium/Hydrogen isotope of water. A quick click through my previous blogs will pick up any number of articles on the subject, along with pertinent scientific references. Let me take a moment to re-cap. Hydrogen in H20 takes two forms - the regular hydrogen, and the heavier isotope of hydrogen, deuterium. The amount of hydrogen and deuterium in any given sample of water varies across the solar system. In the colder, outer zones of the solar system, deuterium is found in proportionately greater abundance compared with the warmer, inner zone. So, water found on comets should have a higher deuterium levels than on the main-belt asteroids, for instance. This is helpful when trying to establish where Earth's water came from. There's a fundamental problem with this, however, as the action of the Sun on the primordial Earth should have driven off most of the volatiles, like water, leaving the planet a dry husk fairly early on. Given that we self-evidently have an abundance of oceanic water on our planet creates a dilemma, solved for a long time by the 'late veneer theory' of water deposition on the Earth surface by impacting comets. This is where the deuterium/hydrogen ratios come in. By that thinking, then, the Earth's water should resemble that of the outer solar system comets. As it turns out, it doesn't. Not only that, but the comets don't appear to be anywhere near as water-laden as once thought. Unexpectedly, perhaps, the Earth's water more closely resembles the outer asteroids from the main belt. This matters when we consider aspects of Zecharia Sitchin's theory regarding the origin of the planet Earth. His rather unusual suggestion, based upon his reading and interpretation of ancient Mesopotamian texts, is that the Earth began its life where the asteroid belt currently resides. It was initially a larger, water-covered planet (equated in the myths with the aqueous monster Tiamat) which was bludgeoned by the usurper Marduk - a huge, fiery planet of unknown origin. Tiamat was rendered asunder - forming the asteroid belt, and delivering the core remnant of the old planet deeper into the inner solar system to become Earth. So, if Sitchin's theory is to be believed, then one would expect that the Earth's water would be (a) in place from the beginning, (b) resemble water contained within the rest of the debris in the asteroid belt, and (c) have very little to do with long-period comets from the Oort Cloud (although some short period comets may, like the asteroids, turn out to be remnants of the ancient collision). The advantage of this theory, scientifically, is that it solves all aspects of the Deuterium/Hydrogen ratio conundrum. Water was readily available on the primordial Earth's surface, unaffected by the heat of the Sun because of its greater initial distance. Some of the water was lost during the collision, providing isotopic clues in other regions of the inner solar system. Long period comets do not play a significant part in the story - the mass collisions of objects which bombarded the inner solar system about 3.9 billion years ago were not comets, but rather multiple collisions associated with the passages of the fiery planet Marduk, and its retinue. The chipped Earth migrated inwards, but at a time when its waters were safe from expulsion by the young Sun. It also explains why water is turning up in all kinds of unexpected nooks and crannies in the inner solar system - like deep within lunar craters, for instance. It's a complicated picture, to be sure, and none of this is terribly easy to grasp without some due consideration. But, I suspect most readers of this blog are more than capable of due consideration, otherwise you'd have stopped reading quite a while ago, right? Okay, so any new data on isotopic ratios is of interest to myself and my fellow researcher Lee Covino, who spearheaded the Sitchinite connection to this science as long ago as 2002 (1). He keeps an eye on the latest science, at a time when new data from probes to the comets and asteroids has thrown the late veneer theory into disarray. Astronomers are coming around to the realisation that water was abundant on the Earth very early on, seemingly unaffected by the action of the Sun (2). Of course, it's not just astronomers who are interested in solving this puzzle. Geophysicists also have more than a casual interest in the Earth's water. Their own perspective is generally closer-to-home, and the theories they generate about the origins of the Earth's water tend to be more Earth-centric, and less cosmic. An example was the recent paper about zircon crystals I discussed in last month's blog (3), where geochemists argued that photosynthesis must have been taking place on Earth way earlier than might be considered possible from the perspective of the late veneer theory (4). 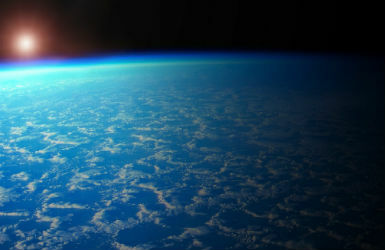 There have also been concerns that the loss of hydrogen into space over billions of years has unhelpfully raised the relative deuterium level in the Earth's surface waters, rendering oceanic water a poor marker for investigations into the origin of terrestrial water in general (5). Now, more arguments for early terrestrial water are emerging, presumably buoyed by this shift in the scientific consensus. A new paper, regarding the analysis of water found in ancient lava magmas from Iceland, suggests that the water has been here all along (6). The deuterium level in this pristine primordial water, untainted by later processes, is much lower than Earth's oceanic water (7). It suggests an origin within the inner solar system. The authors argue that the water came from water-laden dusts within the protoplanetary disk, which locally accreted into the Earth. Of course, one might also argue, in this jumbled, complex field of scientific enquiry, that the higher deuterium ratio of the oceanic waters is an indication of mixing into the brew large amounts of comet water. Other internal factors weighing into this debate include a 'whole-Earth water cycle' potentially moving waters around between the oceans and internal terrestrial reservoirs deep, deep down in the bowels of the Earth (8). Nonetheless, the fact that this pristine terrestrial water discovered within magma is so low in deuterium does at least allow us to conclude that the early Earth was chock-full of inner solar system water. In that, at least, we can be assured. A water world was, of course, Sitchin's description of Tiamat (9). This does not allow us to completely validate his arguments, of course, but they are at least consistent with the complexities of the emerging scientific data. Besides long-period comets from the Oort Cloud, the newly discovered object V774104 is the most distant solar system object yet found (1). It lies three times further away than Pluto, and twice as far away as the approximate outer edge of the Kuiper Belt, known as the Kuiper Cliff. It's a pretty amazing discovery, given that V774104 is only about half the size of Pluto, and it potentially joins a select group - the 'scattered disk objects', which roam the no-man's land between the Kuiper Belt and the inner Oort Cloud. 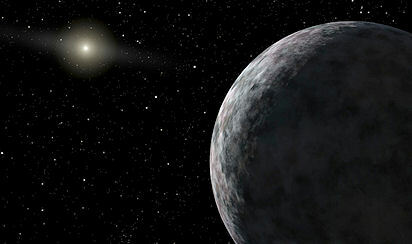 I say 'potentially' because the team who discovered this object, led by astronomers Scott Sheppard and Chad Trujillo, have not yet determined the orbital trajectory of this object with sufficient precision to say whether it is indeed a scattered disk object, or whether it instead belongs to the Inner Oort Cloud (2). Either possibility would provoke further debate about the nature of the outer solar system. 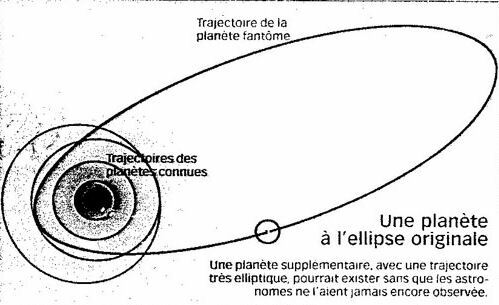 The scattered disk objects have anomalous orbits which indicate that they have been affected by another sizeable body in the past. A number of theories have been put forward to explain their roaming elliptical paths beyond the carefully managed Kuiper Belt zone, whose own objects are shepherded by the planet Neptune. The most straightforward, at least theoretically, is that the scattered disk objects are perturbed by a substantial Planet X body which may or may not still lie somewhere further out. This sizeable, distant object would then have been perturbing these lesser objects by the 'Kosai mechanism' (3). The weather here in Britain can be bad enough at times, but it's as nothing compared to the clouds of molten iron billowing around the sub-brown dwarf PSO J318.5-22. This particular free-floating 'L-Dwarf', positioned about 80 light years away, is about seven or eight Jupiter masses, and is young enough (at between 12 and 20 million years old) to be self-luminous, emitting 'extremely red' light (1). Curiously, though, almost all of the imagined images of this sub-brown dwarf on the internet cast its colour as purple. 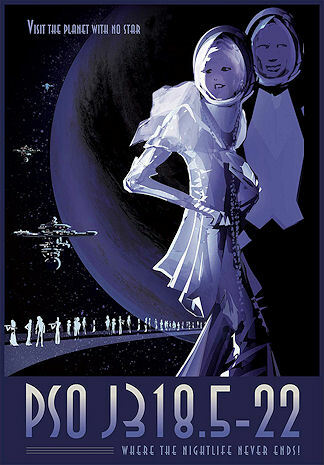 Even NASA has chosen this colour for its old-style 'Exoplanet Travel Bureau' poster (right). This kind of object is, I suspect, similar in size and mass to my proposed Dark Star binary companion, although it's relative infancy allows it to be luminous in a way that our own Dark Star is no longer capable of, given that the Sun's proposed companion is several billions of years old. The purple hue may be nearer the truth for a far older L-Dwarf, like the Dark Star. Because PSO J318.5-22 has no parent star, its own feeble red light is not overcome by that of an adjacent star. 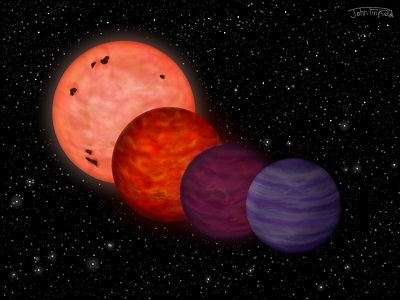 This has allowed astronomers to study the infra-red light emanating from the object over time, and draw some conclusions about the atmospheric conditions prevalent on the sub-brown dwarf. A team from the University of Edinburgh in Scotland used an infra-red telescope in Chile to image the interstellar planet hundreds of times as its rotated. Their analysis showed multiple layers of clouds, varying greatly in thickness. These clouds, which are at about 800 Celsius, contain 'hot dust and molten iron droplets' (2,3). If the Babylonian god Marduk did indeed take the form of a fiery object similar to this, then he was truly a god of steel! This colour issue is important. Before Voyager 2 passed by Neptune and imaged it, Zecharia Sitchin correctly predicted its watery blue colour, based simply upon his reading of the ancient Sumerian texts and the descriptions of their 'gods'. This came after a similar corroboration of the colour of Uranus (7). Many people on the Internet freely dismiss Sitchin as a 'fraud', which is difficult for him to defend against because unfortunately he passed on several years ago. In keeping with the aim of all propaganda dark arts, the accusation of fraud has successfully stuck, even though Sitchin appears to have believed in his own theory right up to the time of his death. He claimed to have got the colours of Neptune and Uranus right, which sounds more like scientific prediction than fraud to me. So, the colour of a predicted planet matters - and that extends to any future discovery of 'Nibiru'. If Nibiru is a terrestrial world, then it is probably grey and red, rather like Pluto. But I've argued that the 'planet' is more likely a sub-brown dwarf system (8), about which we know very little because they're so difficult to detect. The brown dwarf spectrum goes from red to magenta as you reduce mass, but for the cooler end of the spectrum no one really knows. I suspect it's purple for a sub-brown dwarf of several Jupiter masses, giving this world the appearance of a royal planet. As just mentioned, the Babylonians described Nibiru as red, but that be because the planet flares up when moving into the Sun's enormous magnetic field during its perihelion passage, brightening its colour significantly. Or it might be that the observed Nibiru phenomenon is something else, like a outlying terrestrial world in the binary system skirting ours. When out in the outer reaches of the solar system, this old sub-brown dwarf could well be a lot more purple than red. Dwarf stars can punch above their weight, as we have seen on innumerable occasions. They may be faint, but often they exhibit strong flare activity or, in the case of the ultra-cool dwarf star TVLM 513-46546, a hefty magnetic field. This cool star, which can be found 35 light years away in the constellation Boötes, is on the mass boundary of brown and red dwarfs, at about 90 Jupiter masses (1). 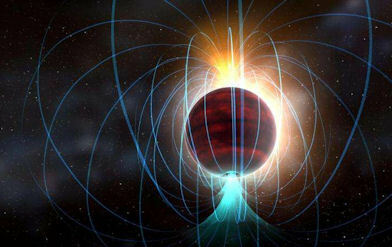 It's magnetic field is the strongest yet found for an ultra-cool dwarf star, except perhaps for those so young that they still have proto-planetary disks in place (2). So powerful, in fact, that the magnetic field around TVLM 513-46546 is likely to be associated with ferocious solar-flare-like eruptions (3), in keeping with the Sun's strongest magnetic zones. It's thought that the processes driving this unusually active field activity may be related to the dwarf star's speedy rotational rate, which is an impressively fast 2 hours. This potentially has implications for life-bearing planets around such dwarf stars. In this particular case, the habitable zone of TVLM 513-46546 is well within the destructive fields, meaning that the potentially habitable world would be in the firing line of high-frequency radiation bombardment from these stellar flares. Such worlds might have their own magnetic field defences, of course, but it might still create problems. Nevertheless, this finding indicates how these ultra-cool dwarf stars should not be underestimated! Our own Earth's magnetic field offers us protection from the worst the Sun can send our way. That planetary magnetic field fluctuates over time, and there has been a lot of speculation within the Planet X field, and elsewhere, about the potential for an impending magnetic field flip in its polarity. That's largely based upon the fact that it's been about 780,000 years since the last reversal in the Earth's magnetic field, which is a much longer period than average between these events. Worse, the magnetic field strength of the Earth has been dropping steadily over the last 200 years, heightening concerns that a flip is on its way. Reassuringly, perhaps, is new research that shows that today's level is still actually well above the average field strength over the last 5 million years (4). That provides us with quite a buffer before the planet reaches a critical point where a reversal in the magnetic field polarity is triggered, it is argued (5). In a world where we've already got quite enough to worry about, this is probably one less thing to concern ourselves with. The generally accepted theory of the Moon's origin has been around for a while. It involved the early Earth having been struck by a Mars-sized body. The ejected debris from this colossal impact was not sufficiently energetic to escape the earth's gravitational field, and instead became a field or ring of debris orbiting the Earth. This eventually accreted into the Moon. The theory is still debated today, and some issues remain unresolved. One such issue, which has come out of more recent ideas about how planets form, is that the Moon's orbit around the Earth should be aligned more or less with the equatorial plane of the Earth. Instead, the lunar orbital tilt is set at about five degrees from that plane, which is an order of magnitude greater than theory allows. This is known as the 'lunar inclination problem'. Perhaps that indicates that the long-held theory of the Moon's formation is incorrect. There are other possibilities to explain the anomaly, however. For instance, some astrophysicists have wondered whether the Earth once had a second smaller moon, now lost, whose influence was enough to disrupt the extant Moon's orbital inclination (2). Or perhaps there was another gravitational influence later which caused the Moon's orbit to become more inclined? That's the thinking behind a new series of computer calculations conducted by astrophysicists based in the south of France. They wondered what level of external gravitational influence was required to cause this more inclined lunar orbit, assuming that a body or bodies passing close to our Earth-Moon system was sufficient to nudge the Moon's orbit out of kilter. There are a lot of random elements at work here. Nevertheless, the result of the calculations generally showed that the mass of these objects needn't be spectacular to have the desired effect - perhaps as low as ~0.01 ME (Earth Mass) (3). After a number of influential 'fly-bys', these objects may have eventually collided with the Earth/Moon system, and thus disappeared into their still-forming bodies during a late point in the accreting process. It seems to me that this later conclusion is simply a neat piece of house-keeping. If the theory calls for a repeated series of fly-bys by sizeable chunks of rock, then where are they now? The easiest and neatest arrangement is for these bodies to have been absorbed by the Earth-Moon system once their perturbing work was done. There are other possibilities, of course. 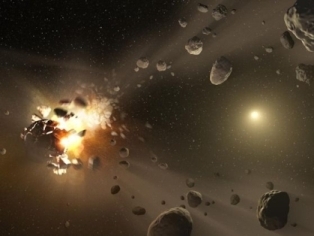 3.9 billion years ago, the inner solar system was subject to a massive bombardment of planetesimals. Their influence may have extended beyond the major impact craters we see today pock-marking the lunar surface. However, one might imagine that their interaction would have been more statistically random, such that any influence on the orbital path of the Moon would have been largely smoothed out. In other words, the passing showers of comets, if that's what they were, were hit-and-run affairs passing the Earth-Moon system on all sides and from all directions. I suspect that the calculated models mentioned in the paper above called from a repeated pattern of fly-bys with an emphasis on a collective gravitational influence from a single direction over time. 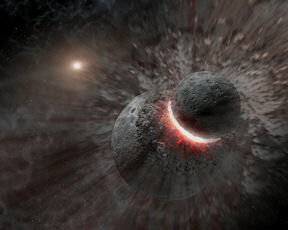 Another possibility is that the perturbing influence was not the repeated passing of a mass of small bodies, but instead a catastrophic passage of something much greater in mass - an event of great significance 3.9 billion years ago which, in one fell swoop, knocked the Moon's orbit out of line with the Earth's equatorial plane. One of the authors of the paper, Alessandro Morbidelli, has been influenced by such ideas in the past, as I have written about previously (4). He's shown a particular interest in the possibility of stellar fly-bys, or even the one-time presence of a brown dwarf in the solar system, to explain (the still unresolved) anomalies in the outer solar system (5). Does Dr Morbidelli still 'believe' in this planète fantôme? I think this new research about the Moon's origin indicates that he might still be on the trail of Planet X. How so? Because the 'lunar inclination problem' might well be explained by catastrophic events which took place 3.9 billion years ago, the planetary origin of which still lies undiscovered in the outer solar system. Red dwarf stars are plentiful, it seems, accounting for twelve times as many stars as their larger cousins, the Sun-like yellow dwarfs. Red dwarfs also have plenty of planets, too, including a recently discovered Earth-sized world orbiting one of these dim stars located 39 light years away, the red dwarf Gliese 1132 (1). The planet, known as GJ 1132b, is the closest known rocky exoplanet so far discovered, and offers scientists their best opportunity yet to study another Earth-like planet. However, although the planet orbits a dimmer, cooler star than our own, its cruising distance is much closer than the Earth is to the Sun, meaning that the planet is actually probably too hot for any kind of habitation. In other words, it lies way inside the inner edge of the habitable band known as the 'Goldilocks Zone'. So, it's more likely to resemble the Earth's sister world, Venus, which, like the goddess herself, is way too hot to handle. Despite this, the planet has a metal core, implying the potential for a protective magnetic field. So, GJ 1132b's discoverers are hopeful of an extant atmosphere which might be observable using some of today's cutting edge telescopes, like the Hubble Space Telescope. 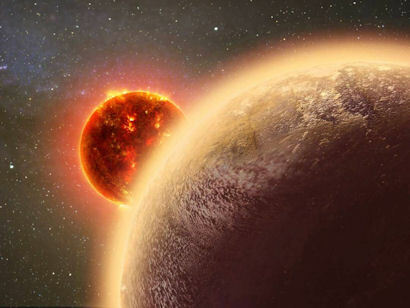 It's probably fair to say that this finding is not going to set the general public's pulse racing, but scientists will see in this a golden opportunity to obtain data about conditions on a rocky planet outside of our solar system. the fact that the planet orbits a dwarf star is particularly helpful, because the reflected light from the planet will not be completely blasted out by that of the parent's star's. Which means that scientists will be on the hunt for rocky exoplanets orbiting old low mass stars, like Gliese 1132. Hopefully, then, as more brown dwarfs (which are even smaller and dimmer than red dwarfs) get discovered in our neighbourhood, their potential planets will be even more sought after by planetary scientists, eager to image these worlds and their atmospheres directly. That brings the prospect of Earth-like planets being found orbiting around brown dwarfs that much closer. "The Red Planet: Tony (Hancock) takes up astronomy, and discovers something terrible among the stars."